Sheer Voile drapes help create breathtaking displays and simply stunning pipe and drape backdrops! This 118 inch ultra wide fabric is sheer / see-through, making it a versatile material for a variety of decorating applications and uplighting. Our Sheer Voile drape is Inherently Flame Retardant (IFR) and passes the NFPA 701 fire code. Each drape measures 218 inches tall x 118 inches wide. Material has natural edges that are not serged or hemmed. The drape is sewn 2 inches taller than 18 feet so that a couple of inches pool on the floor when used at an 18 foot height. 100% Polyester. Delicate machine washable and dryer safe - see Laundering tab for details. Quantity 1 = 1 drape. 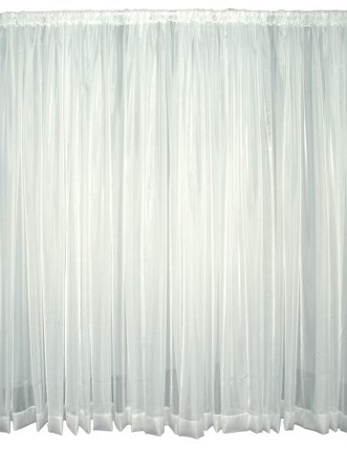 To achieve the best look with this Sheer Voile fabric, extra gathering is highly recommend. We suggest a minimum of four drapes per 10 foot wide span. This is a sheer, see-through fabric and is approximately 0% - 30% opaque (light blocking). This opacity percentage is an estimate only, and for normal / standard lighting situations. A variety of factors can affect the opacity of a fabric, including where it is being used (near a wall vs. dividing the middle of a room), light sources (such as hanging in front of a window with sunlight shining in, etc. ), and the amount of fullness in the material (the amount of "bunching"). Weight (Approximate, Each): 1 lb. 13 oz. Machine wash cold on a Delicate / Gentle cycle only. If needed, use only a gentle detergent, preferably one designed for delicate fabrics. Tumble dry on low heat, using a Delicate / Gentle cycle if available. If there is no Delicate / Gentle cycle for drying available, you can also hang to dry (not in direct sunlight). For ironing, use low heat and light steam. It is always suggested to test on an inconspicuous area first.